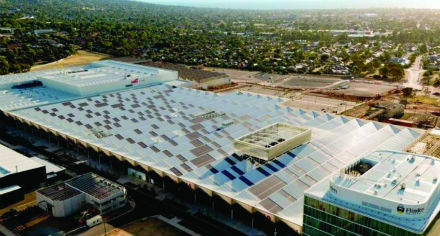 An energy production and trading scheme designed for the Tonsley Innovation District in Adelaide will incorporate one of Australia’s largest rooftop solar arrays to provide energy to businesses and homes within the growing precinct. The South Australia project will be delivered by Enwave Energy, a subsidiary of Enwave Australia. Enwave Australia CEO Cameron Evans said Enwave Energy would invest about $40 million over a 50-year period for photovoltaics, battery storage, smart technologies and future electrical assets. The District Energy Scheme will use energy generated by about 20 000 solar PV panels installed on the expansive eight-hectare roof of the former Mitsubishi factory building and adjoining TAFE SA building. A battery storage solution will be added to the 6 MW solar array when demand for the service increases. This is likely to be when the Tonsley site grows to include residential housing and more industry. “We’ll have an existing connection with the grid as well as having some onsite generation, primarily utilising solar PV and that enables us to draw on either the grid or our own energy generated on site depending upon the time of day, and the amount of energy available” Evans said. “The benefits of that approach mean that we increase reliability to the site by having on-site generation while also ensuring we can provide a competitive energy cost by being able to either draw on our own energy sources when the grid pricing is high or utilise the grid when we don’t have solar available or during off-peak times.” Optimisation of inflow/ouflow from the system will be decided by a smart management system. Evans said the District Energy Scheme would also integrate a range of smart technologies and networks to monitor and regulate the system. Businesses at Tonsley have the choice to buy their electricity from either Enwave Energy or any energy retailer they choose. Other components of the District Energy Scheme will include recycled water and thermal energy utilities facilitated by on-site infrastructure. The company is expecting to commence the installation of the solar array and key assets next year. The solar system is expected to be fully operational by the second half of 2019. Tonsley is managed by Renewal SA on behalf of the South Australian government. Renewal SA general manager of Property Mark Devine said the Enwave proposal would deliver on Tonsley’s commitment to become a climate smart district. “The scheme will help consolidate Tonsley as a hub for renewable energy investment and innovation and help to attract more businesses keen to establish in an environmentally sustainable innovation district,” Devine said.